The SA-400 Classic Siren is called the "Classic" for a reason. It's because for nearly 35 years, the Sa-400 has been in service and keeping you safe. It was first introduced nearly 35 years go for police, fire and EMS agencies. It is simply an industry workhorse. Several thousand of them are still in service today alerting motorists of an approaching police officer, ambulance or other emergency vehicles. The SA-400 is a 200 watt capable siren with a classic rotary switch for easy selection of all of your siren tones, your radio. It includes a momentary push button for tone control and override and a large PA volume knob for control the loudness of the included public address system. A high quality PTT (push-to-talk) microphone, makes all of your uses of the PA system, clean clear and reliable. The noise-cancelling PA microphone is a high quality siren microphone with a large push-to-talk (PTT) button that is easy to use even in the dark. The face plate lights up in the dark with the LED back lighting that can be controlled via your vehicles dimmer circuit. The SA-500 includes a lot of features. You don't have to use all of them. That is why you can program the police / fire siren to your needs easily by using the internal DIP switches. 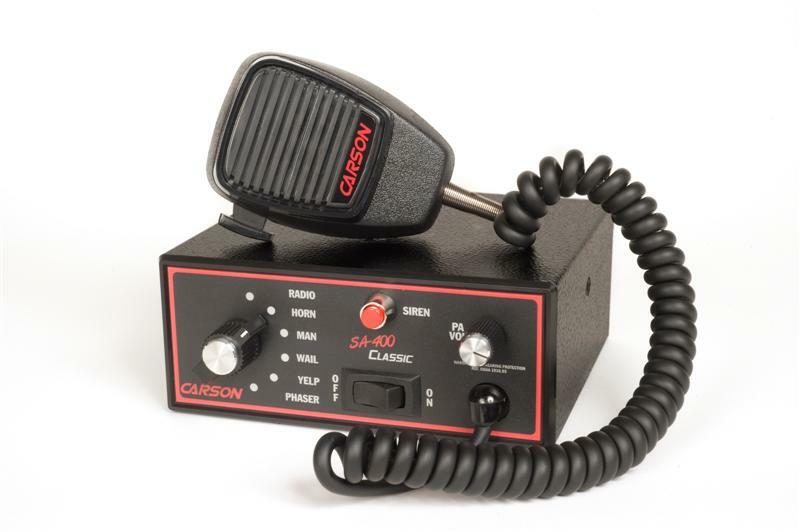 Dip switches are a simple way that you can turn certain features of the SA-400 Carson Police Fire Siren on or off. Many sirens are only 100 watts. This is the standard. 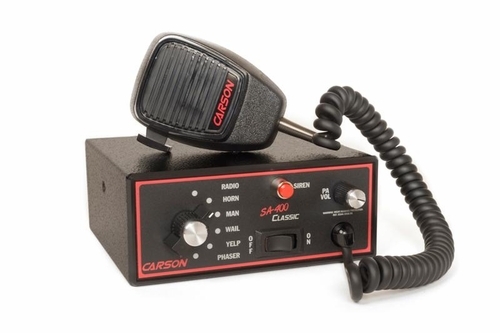 However, with the SA-400 Classic siren, it is 200 watts. You can power 2 siren speakers with the siren. It does not have dual tone capability so both speakers will be sounding the same thing, but with 200 watts, it will be louder and give you more warning power! Excellent Siren, fits easily in center console of my Suzuki SX4. The speaker option was taken advantage of in this order and it too fit like it was made for this vehicle, in the lower front grill, mounted bracket on bumper support bar. Very easy to install, extremely loud. Moves traffic! Tech support for this item was excellent as well, when contcted for installation questions.